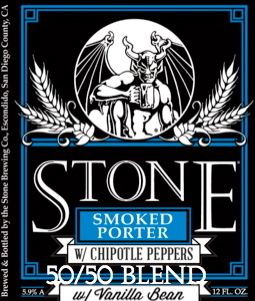 As one who tries to attend as many special Stone Brewing Co. events at my local New York City beer bars as possible; I was excited to hear that two variations on their Smoked Porter that I previously tried and enjoyed both on tap and cask were being released in bottles. After splitting a bottle of the Vanilla Bean version with a friend at The Ginger Man bar in NYC I quickly sought out a bottle of each version (SP w/ Chipotle Peppers and SP w/ Vanilla Bean) to include in a tasting that I planned to have with my older brother a few nights later. In order to make the most out of the experience of drinking these two special brews my brother and I split them evenly. I drank from two identical Duclaw Brewing Co. snifters and my brother drank from two Flying Dog Brewery taster glasses. After analyzing each beer we decided to blend them to taste how the flavors would play off each other. Adventures Into The Mind of a Beer Geek: As mentioned in previous reviews variations on or additions to a base beer leave room for the base beer or style’s identity to be minimized for even lost. However, with such as a coveted beer as Stone Smoked Porter; opinions on the success of the above variations will have a wide range. In the end I applaud Greg Koch, Mitch Steele, and the Stone Brewing Company staff for bottling these variations in order to highlight specific characteristics of the base beer in an artisinal manner. However, in the end of the day I prefer this beer without anything added both as a porter and a smoked beer. I should note that while proofreading this post I thought of a possible way to help me further appreciate these variations (versions), which is to pair them with complementary foods. I’d recommend pairing the Smoked Porter w/ Chipotle Peppers w/ grilled or smoked meats, beef entrees (spicy or not), or aged gouda. For the Smoked Porter w/ Vanilla Bean I go for desserts like tiramisu, chocolate cake, and chocolate mousse, and desserts with white chocolate. Cheers! 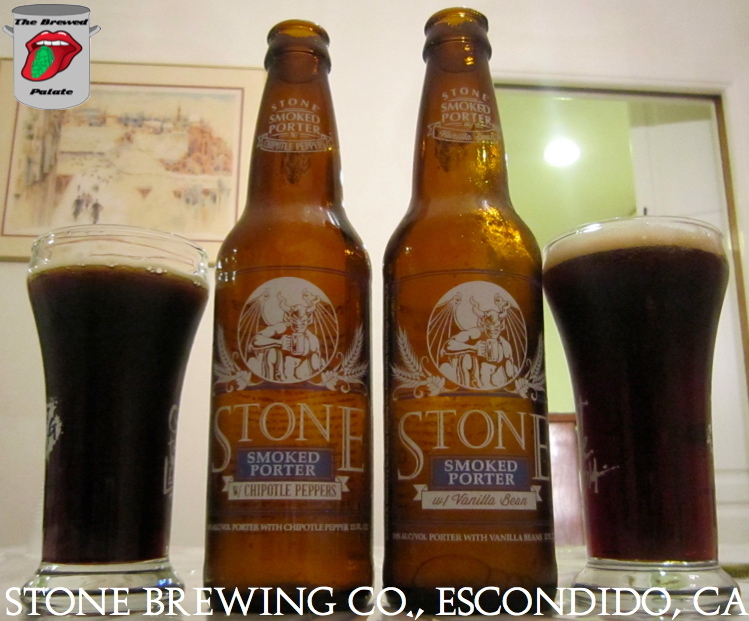 This entry was posted in Beer Reviews and tagged american porter, craft beer, Greg Koch, Mitch Steele, San Diego beer, smoked beer, Smoked Porter with Chipotle Peppers, Smoked Porter with Vanilla Bean, Stone Brewing Company, Stone Smoked Porter. Bookmark the permalink.